Our modern culture, especially the corporate culture, is heavily result-oriented, with an excessive focus on outcomes like for example, productivity. However here is an attitude or an approach from a corporate group, which is uncommon but needs to be explored and experimented in management and education. This article examines this view in the light of a deeper perspective. Timothy Rerlick, senior director of professional development at CME group, states that in his company the main emphasis is not on “output” but on “effort”. “Instead of focussing on output” says Rerlick “which can be seen as a result of talent (and emblematic of a fixed mind-set), we think about effort. Instead of celebrating employee achievement we say ‘Thank you for the effort’”. The management of the CME group regards the approach based on talent, achievement and output as “fixed mind-set” and the other approach based on effort as the more progressive “growth mind-set.” There is an element of spirituality in this approach. The divine Teacher in the Indian scripture Bagavad Gita says to his disciple Arjuna: “You have the right only to work and not for the result”. The effort belongs to the domain of work but the output belongs to the realm of results. But nothing is said about how “effort” is included in the performance management or motivation system of the company. Most organisations assess performance not by effort but by output like for example, productivity. If this company lays a greater emphasis on effort, how it is incorporated in the performance review of employees? If a low-performer makes a sincere and persistent effort to improve, which is a growth mind set, is she as much appreciated or recognised as the high-performer? This principle applies equally to assessing student-performance in education? Let us now examine briefly what are the factors which shape effort and output and how they can be incorporated in management and education. Effort has a quantitative as well as a qualitative dimension. The quantity of effort depends on physical strength, vital energy and will-power and its quality depends on dedication, selflessness, concentration and the aspiration for progress, excellence and perfection or in other words character of the person. The output depends on effort but also on knowledge, talent and skill. Someone may be crude, selfish and corrupt in his character but he may have great vital energy and well-developed faculties of action with some talent or skill in a line of activity. Such a person will be tremendously productive. In the traditional corporate world he will be admired as a star performer or a great executive or professional. His weakness and defects in character are ignored. On the other hand, another person may be honest, kind, compassionate, refined, sensitive, cultured, humble, willing to work hard and improve, at a higher level of inner development, but if he has some weakness or defects in his vital being or faculties of action he may not be very productive or efficient in his work. Such a person cannot thrive in the corporate world. If he is working in a hard-core traditional business organisation, he may be fired for incompetence or even if he is retained he cannot rise up in the corporate ladder and will remain at lower levels as an unimportant and insignificant person in the organisation. This principle applies equally to education. The academic performance of a student depends on a combination of three factors: Intelligence, Interest and Effort. When the student is interested in a subject, effort comes naturally and when it is illumined by a good intelligence it leads to academic excellence. When the intelligence is lacking, but the interest is there, the spontaneous effort it generates, can awaken the intelligence by pouring vital energy into it, and lead to good academic performance. If both interest and intelligence are lacking then the academic performance is likely to be poor. But intelligent and interest can be developed by a persistent and patient effort and concentration, which develops will-power and character. A student who is willing to make this effort and does it with persistence, patience and hard work has strength of character, though he may be poor in academic performance. And he is likely to be much more successful in life than someone who has a brilliant academic career but lacking in this quality of character. We have to evolve a new culture of management and education which takes into consideration all the factors which we have discussed so far. In management, we have to think beyond performance and productivity. If the corporate world has to progress further in its higher and future evolution, people with character and compassion and with a greater intellectual, ethical, aesthetic and spiritual sensitivity and culture have to ascend to leadership position at all levels from the board of directors to the lowest supervisory positions. For this to happen, we have to build a new corporate culture and environment, where these qualities are valued, recognised, appreciated, rewarded and cultivated at every stage of human development, beginning with recruitment and selection and later in the domains of assessment, motivation and reward, training and development. Similarly in education we have to think beyond enhancing the academic performance of the student to the integral development of the learner which means, all the potentialities, power and faculties of his body, mind, heart and soul. This requires a more holistic assessment of the educational progress or achievement of the student with a greater emphasis on self-knowledge, self–mastery, progressive leaning and constant improvement rather than on book knowledge and gradations based on academic performance. Completely agree with this article. The efforts people put into what they do should always be noticed, not only the results they produce. 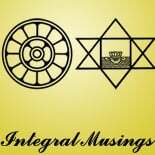 This entry was posted on October 4, 2018 by integralmusings in Integral Management.